Your Medical School Doesn't Matter. (Until It's the only thing that matters). What follows is a look at what matters when it comes to securing a residency and how, while your school "doesn't matter," (we'll explain why in a bit), the learning environment cultivated by that school, and how it has specifically prepared you for a career in medicine, can be the single biggest factor in your success. First, here's some background. Year after year, the National Residency Match Program's (NRMP) residency director survey demonstrates that the school a candidate attended is such a low priority in their decision making process, it doesn't even crack the top twenty factors when considering an applicant for an interview invitation. On its surface, the NRMP survey implies that whatever medical school you choose to attend is irrelevant, as long as you absorb the material and can perform when evaluated on exams, in front of preceptors, etc., that's all that matters. This is accurate, to a point, but fully grasping it requires critical self-awareness and an understanding of the bigger picture. Medical students don't thrive in a vacuum. They need a curriculum, faculty, support structure, living environment, extra-curricular opportunity, even a student body, that is shaped to help them succeed. A school doesn't just provide information, it should help students develop on a personal level into the sort of physician a residency director wants on their team and, ultimately, caring for their community. Let's take a look at how that comes together at Trinity. Before we get going, there's one basic element of any medical school that must always be considered first: accreditation. As an international school training students to practice in North America, we feel it is incumbent on us to make sure that we always maintain our accredited status and that information on state approvals is plainly available. In that spirit, Trinity School of Medicine is accredited by CAAM-HP (in fact, we were just re-evaluated and they determined we were at the highest currently held standard), which is in turn recognized as comparable to the Liaison Committee on Medical Education (LCME) by the US Department of Education's National Committee on Foreign Medical Education and Accreditation (NCFMEA). Trinity is also listed in the World Directory of Medical Schools, and recognized by the Education Committee for Foreign Medical Graduates (ECFMG), which allows our students to sit for the USMLE licensing exams and subsequently apply for residency programs through both the US (NRMP) and Canadian (CaRMS) matching services. However, we're not here to talk about a school meeting a minimum standard of quality. Today we're focusing on what gives students the best shot at succeeding in their efforts to secure a residency match and have a long, successful career. 1. 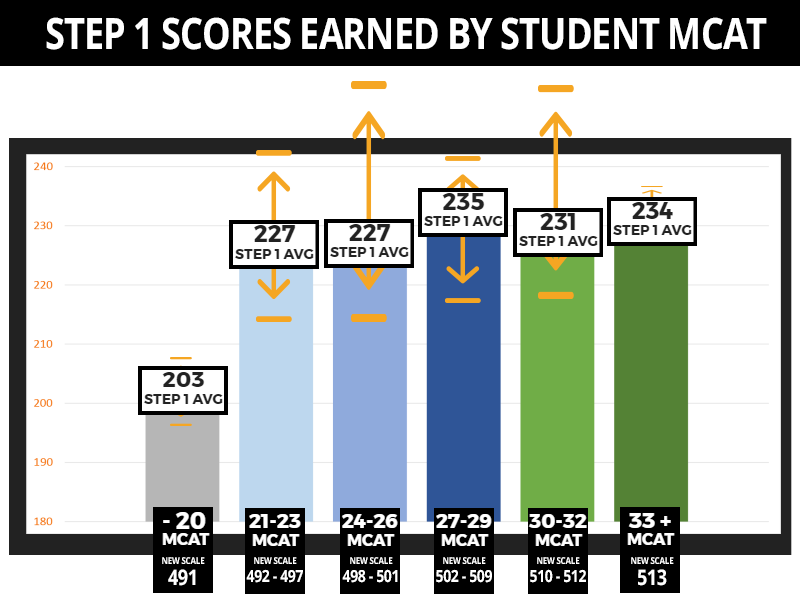 First, and foremost: USMLE Step-1 score is king. The NRMP's report has shown year after year, the number one criteria has almost always been, and will likely remain, Step-1 score. Whether it's our coordinated curriculum; our ILP program, which allows students to get up to speed with an additional term of education without incurring additional tuition costs; our Academic Progress Committee, allowing faculty to discuss each student's strengths and areas for improvement and working with those students to refine their study habits when necessary; or our wholly integrated Step-1 prep, placing the methodology and mindset alongside every lecture and lesson, Trinity School of Medicine is designed for student success. We want our students to not just gain the critical knowledge necessary to practice medicine, but to ensure that they are ready to demonstrate that knowledge when called upon in any situation, whether during licensing exams or a stressful day on rotations. 2. Letters of recommendations in the specialty. Something we hear whenever we speak with an alum is just how prepared they felt on that first day of clinical rotations. More often than not, preceptors openly comment on their preparedness relative to their counterparts from other schools. This isn't a fluke. 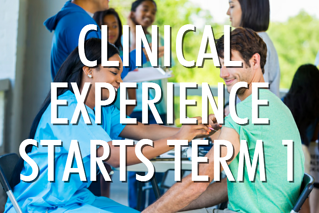 Trinity School of Medicine's clinical experience starts the first week of basic sciences and only builds throughout those first five terms. So much of clinical rotations can be about performing under pressure and realizing that you are being evaluated at all times. At the same time, almost paradoxically, a major concern of medical students is whether or not their performance is being noticed at all. Trinity School of Medicine's approach to clinical medicine goes above and beyond, and it gets students noticed. 3. The MSPE/dean's letter. At Trinity, we consider a "small class" to have 25 students, not 250. Between those small classes and our 12% attrition rate, each student is more than just a familiar face to the faculty. They're part of an intimate community of students, educators, and administrators. Even outside of the classroom, the Trinity community is tightly connected: there's a joint faculty/student talent show on the holidays. It's a unique environment that creates a special type of community bond, with everyone far from home and working closely, day after day. This is, admittedly, a strange thing to bring up in a point on student performance evaluations for residency, but it goes to a very important part of the bigger picture: when it comes time to update and affirm a formal medical student performance evaluation (MSPE), you are not a random student to our dean, Dr. Adkison. You are precisely you. She knows your strengths, any challenges you have overcome, she probably even knows your sense of humor. All of this leads to a more fully fledged letter from the dean certifying you as prepared to head out into the world and render care to your patients, a proud representation of Trinity School of Medicine. 4. 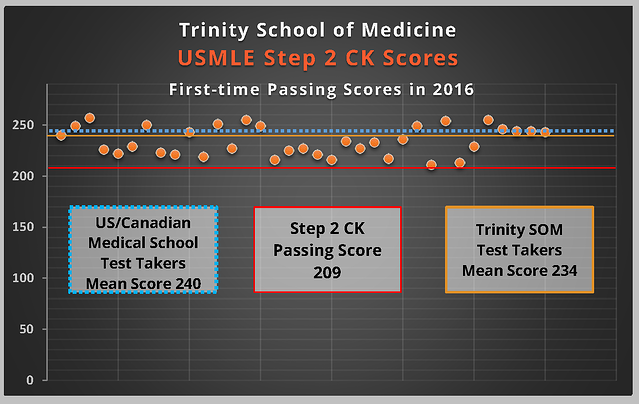 USMLE Step-2 (CS and CK) scores Trinity's approach here is twofold. First, we have made sure to secure clerkship positions in keeping with our growth, ensuring that every one of our students can proceed upon passing Step 1, immediately. There are no waiting lists for rotations, so we never have medical students sitting on their hands. We also have 100% of our core rotations in one central location- Baltimore, Maryland- under the tutelage of a dedicated faculty and assistant dean. At the same time, our associate dean of clinical clerkships, Dr. Paula Dessauer Wilson, works with students on the academic side, while also providing career guidance on many other areas of professional development, not the least of which is residency selection strategy. Trinity also employs National Board of Medical Examiners (NBME), clinical subject exams ("shelf exams") to assess the educational achievement of individual students in specific subject areas in each core discipline. Shelf exams provide a window into Trinity student preparation and future success on the Step 2-CK exam. Students who have scored at the Honors level on one or more shelf exams have passed the Step 2 CK exam on their first attempt with a score of 230 or above. Students who need additional time to study and prepare for CK are identified through their shelf performance, to assure that they are fully prepared to pass on their first attempt, ultimately ensuring they better represent their capabilities and potential in the match. Under the active, watchful eye of our faculty and leadership, Trinity students have a tremendous opportunity to excel, contributing to high performance in the hospital and strong grades reflecting that performance, another major factor in residency selection. 5. Personal statement. While a student's personal statement is acknowledged as a critical element to success in the match, what goes into properly shaping the person crafting that statement is frequently missed. 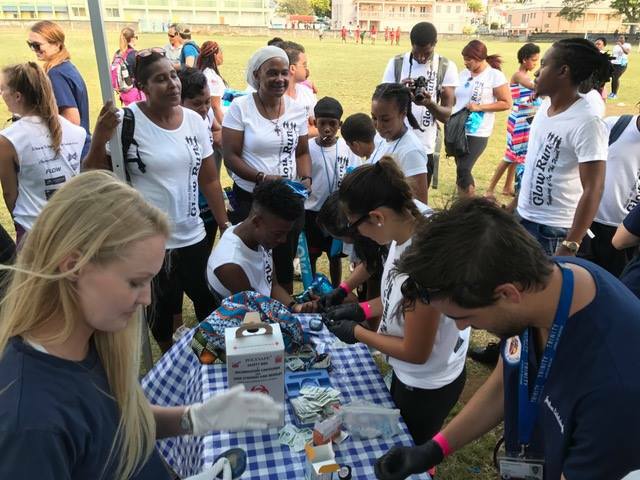 Caribbean medical schools are about giving students an opportunity to succeed outside of the inflated competition of the US and Canadian systems. In this respect, Trinity is no different. However, our campus culture and holistic admissions process, tends to fill our student body with a very sincere, hard working population of future physicians, many of whom are incredibly engaged with philanthropic outreach throughout their time in St. Vincent. Trinity provides many opportunities for extra-curricular clinical training, through events like the Village Doctor Exercise or the medical mission work of the World Pediatric Project. Our students frequently go above and beyond on their own, building relationships with local orphanages, holding health fairs (under volunteer faculty supervision), even staging relief efforts and major fundraisers and material drives for those in need. As we said, where you go to medical school doesn't even crack the top 20 criteria of factors important to residency program directors, and that's a good thing for the entire medical field. There are excellent physicians coming from every medical school, and these students bring their own unique perspectives, compassion, and experiences to the practice of medicine, strengthening it through diversity. However, saying the school doesn't matter is inaccurate. The name of your medical school doesn't matter. When it comes down to it though, almost every factor in residency match success comes from you: your USMLE Step scores, your attributes highlighted in letters of recommendation, a dean's letter that captures who you are, not just what you've done. These personal achievements come from the environment that shaped you, the faculty that taught you, and the experiences that were made available to you. It's on medical students to make the right choices for themselves, but at the same time, it's on the medical school to make sure we offer the singular best opportunity we can for those students. 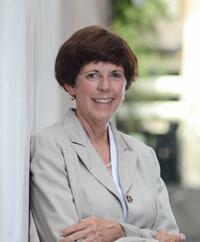 This is a guiding principal at Trinity School of Medicine and, you know what? It's working out very well.